Today, May 27, 2006 is both a sad day and a happy day. Sad, because today we had to put our Harley (originally Ewok when we adopted her) to sleep. Harley was 11 years, 1 month and 3 days old. It's also a happy day. Happy, because it has afforded me a chance to reflect back on the last 11 years that I had the wonderful opportunity to have Harley in mine and my family's lives. Let me tell you about Harley. In 1995, I had been separated for just over two years. My two sons visited every other weekend and some evenings during the week. During the times between those visits it was lonely. My girlfriend Ginger, who is now my wife, wondered if a cat might be the answer. I had been a dog lover all my life, but living in an apartment, I knew that a dog in that situation wouldn't be a good idea. So I agreed to consider a cat. Ginger, who has been a long time cat owner, agreed to do the leg work to find a good kitty for me. Her search took her to Gagemount Animal Hospital since they were participating in the Animal Welfare Association program. It was there they found two possible kitties. After work that day, I went back with them to see which one would become our newest family member. Ewok purred like a motorcycle, and I fell in love with her immediately. On July 7, 1995 Ewok came home with us and she became "Harley". She was 10 weeks old. When I would come home from work, Harley would greet me, still purring like that motorcycle, and always running between my feet, rubbing against me, telling me she was glad I was home. Harley had her chair (I've attached a photo of her and her chair). Every night I'd sit in that chair, with Harley on her "perch". She was the queen of the house. In 1998, now living in a town house, we decided the time was right to get that dog I'd always wanted. So, in June of 1999, we brought home Casey, a 7 week old Golden Retriever. Harley took an immediate liking to Casey, and over time the two of them were like two peas in a pod. Many a time, I would watch as Harley groomed Casey. A 9 pound cat, grooming a 70 pound Golden! What a sight! One of Harley's 'quirks' was her penchant to jump into the bathtub after I had finished my shower, and lap up the water remaining in the tub. Many a morning when I would step out of the shower I would find her curled up in the bathroom sink, purring as always. Jeff and Greg would come over and loved spending time with Harley and Casey just as much as I did. Harley was the first pet they ever had, and she didn't disappoint! Another favourite place for her to stay was on Greg's bed (the top bunk of a bunk bed). Later in her life, that bunk would become the place where she would spend her last days. As with every family, everyone grows older. My sons grew older, got involved in things teenagers did, were busy with their lives. In 2000, Ginger and I married, and in 2001 Harley, Casey and I moved to Pittsburgh, Pennsylvania (where Ginger is from). Harley and Casey settled into their new home and, as usual, Harley was the queen of the house. Along with a new home, Harley got a new 'brother'. Smokee Ko, a Chinese Crested Powder Puff, my wife's dog, always looked at Harley with a bit of a suspicious glance, but by and large, they 'tolerated' each other and I know deep down, they loved each other. 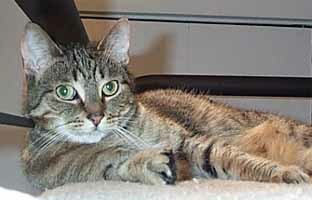 In 2005, Harley was starting to have a problem of not making it to her litter box before going pee. A trip to the vet determined she was suffering from kidney stones and, after a week of treatment for a bladder infection, she was back to her old self, greeting me on my return from work, ruling the house, grooming Casey. Harley has never been a big cat. I think that's partly why I fell in love with her. At her heaviest, she weighed only 9 pounds. After her bout with the bladder infection and kidney troubles in 2005, her weight was down to about 7 and a half pounds, but she was still active and still purring like a motorcycle! About two weeks ago, I noticed she wasn't eating much any more and, once again, wasn't making it to her litter box in time. She was markedly losing weight as well. By this time her weight was down to 6 pounds. Her vet gave us the bad news that she likely wouldn't have too much more time. I made one of the hardest decisions in my life, and made an appointment to take her back to the vet's to have her put down. While she wasn't in pain, wasn't really suffering, she was slowly starving to death. I wouldn't be able to watch that happen. Today, Ginger and I took Harley to the vet and we got to spend a final few minutes with her. She looked so peaceful and we know she is in a better place now. 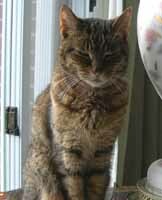 Harley will be cremated, and her remains will come home next week. She will always remain with us in spirit. We know we'll be together again someday, she's just gone ahead to set up house and to establish she's the 'queen' there too! As I said at the beginning, it's a sad day and a happy day. I couldn't imagine what the last 11 years would have been like without Harley in my life. She truly was daddy's little girl. I'd like to take this opportunity to thank the Animal Welfare Association for all it does and to express my eternal gratitude for bringing Harley and I together.